All packaged soft starters are supplied with a customzied documentation package. This includes mechanical and electrical drawings and installation manuals. 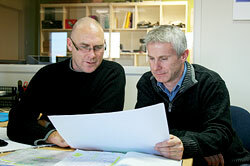 Our Support Engineers are on stand-by ready to assist with any technical questions you may have. You can be assured that your request will go straight to a qualified engineer with extensive experience. Support is available via phone or email (or site-visit if required). In the unlikely event of a fault or other issue AuCom Support Engineers are available to guide you through your logs and assist to isolate and eliminate any issues. Our engineers have access to diagnostic tools to understand precisely the conditions of the fault. In the event of a more serious failure, AuCom has repair facilities, supported by spare part inventory. AuCom can provide recommendations for spare parts to be held at your site. Spare parts and service are available through AuCom. AuCom's service department offers component replacement or software upgrades for minor, major or emergency repairs as required. Contact us for more details on warranty and repair policies.